(CNN) -- Israa, a 23-year-old college student, said she's worried about the job market she'll find when she graduates this year from Mustansiriya University in Baghdad, Iraq. 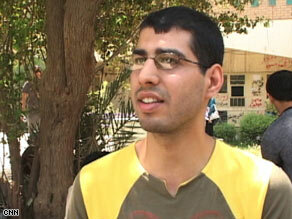 Abbas Jalal, 23, says he wants to be a college lecturer. "I think that I will get a job," the soon-to-be graduate says. "It is going to be hard," she said, citing concerns about prospects of finding a position in her field, English translation. "Because in Iraq, it is so hard to find a job, especially nowadays." For Israa and her classmates, the recession and job prospects are top worries, pushing aside concerns about the sectarian warfare and the raging tension that once coursed through Iraq's capital. She and other soon-to-be graduates in English translation were interviewed on the campus about their hopes and dreams for the future. Three of the four did not want their last names to be used. Violence struck Mustansiriya in early 2007 when insurgents targeting faculty and students at the college killed more than 100 people in two attacks; scores of people were wounded in those attacks. The warfare upended Iraq's higher education system, closing schools and sparking a massive "brain drain" of professionals and students from Baghdad to other parts of Iraq as well as to other countries. However, violence in the city has plummeted lately and, like other Baghdad residents, Israa said she and her classmates are wary but aren't as worried as much about street violence as they once had been. "I think the security issue is getting better," she said. Waleed, 24, has his eye on an Iraqi Foreign Ministry job, where he can have contact with Europeans, Americans and other nationalities. "I hope that I can find a job that makes me in contact with the people with foreign countries," he said. He said he feels "positive" about his country's future but said it is important that Iraqis work together and combat corruption in all the government's ministries. "I hope that someone will fix that situation," Waleed said. Abbas Jalal, 23, said he wants a job as a college lecturer. He said it is hard to gauge the economy, which sometimes appears to be improving and sometimes backslides. "But I hope, I think that I will get a job," he said. He said the security and political challenges the government faces remain Iraq's "biggest threat." But he said he thinks Iraqi forces will be able to take control after American troops leave the country by the end of 2011. "I think the situation will improve, and I hope it improves," Jalal said, noting that lingering political and sectarian tensions pose "a real threat to me and to my success." At the same time, he and most of his friends said they don't want to find their fortunes elsewhere. "I see my future in Iraq and hope not to leave Iraq," Jalal said. The memories of the 2007 carnage at Mustansiriya persist: the strewn body parts and student ID cards, the shards of glass that littered once-bustling hallways. But at the same time, there's a stubborn determination to go on, reflected by a banner at a school entrance that says, "We will not succumb to terror." Maiys, 24, reflects this determination, expressing both the idealism and realism of people across the city. "We are not living in a normal country," she said. "We have many problems, sectarian problems, political problems. So it is very normal that jobs are already difficult in Iraq." On the other hand, she said she's "positive nowadays, because the situation is getting better." She said she's hopeful that Iraqi troops will take the baton from Americans and maintain the improving security. Does she see her future in Iraq? "I hope so," Maiys said. "I see myself maybe after 10 or 20 years, I'm in my country, and I'm in a very big position. Maybe it is everybody's hope, not only me."